Ghumura was also used as a Darbari dance in the princely state of Kalahandi and played by the earstwhile Kalahandi state during war times. The typical mixed sound that comes out of the musical instruments like Ghumura, Nishan, Dhol, Taal, Madal etc. and the expressions and movements of the artists make this dance to be a "Heroic Dance". 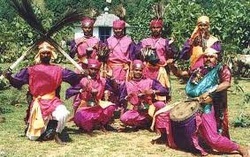 Since thousands of years Ghumura dance has evolved from a war dance to a dance form for cultural and social activities. The dance is associated with social entertainment, relaxation, love, devotion and friendly brotherhood among all class, creed and religion in the present days. Traditionally this dance is also associated with Nuakhai and Dasahara celebration in Kalahandi and large parts of South Western Orissa. Ghumura dance is still hidden in the village level in South Western Odisha and some parts of bordering Andhra Pradesh and Chhattisgarh. Kalahandi region has taken a leading rule in popularizing and retaining its unique identity of Ghumura dance. Kalahandi is mainly known as land of Ghumura. Ghumura dance has got the opportunity to represent the nation in various international events Delhi, Moscow, Kolkata, and various other cities in India. Ghumura dance is also one of the most researched folk dance form in Odisha. Ruk Mar Nacha (& Chhau dance): This is a rudimentary form of the more evolved Chhau dance of West Bengal. Performed in the Mayurbhanj District of Orissa, it has its base in the martial arts tradition. The dance is a stylized mock battle in which two groups of dancers armed with swords and shields, alternatively attack and defend themselves with vigorous movements and elegant stances. Especially notable is the accompanying music, noted for its rhythmic complexities and vigorous percussion. The instruments include 'Mahuri' - a double reeded instrument, 'Dhola' - a barrel shaped two-sided drum, 'Dhumsa' - a hemispherical drum and 'Chadchadi' - a short cylindrical drum. Goti Pua: The goti puas are boy dancers who dress up as girls. They are students of the akhadas, or gymnasia, established by Ramachandradeva in Puri, in the periphery of the temple. As they were offshoots of the akhada system, goti puas also came to be known as akhada pilas - boys attached to akhadas. Another reason often given to justify the emergence of the goti pua system is that some followers of the Vaishnava religion disapproved of dancing by women as a pretext for worship - they introduced the practice of dancing by boys dressed as girls. The word goti means 'one', 'single' and pua, 'boy', but the goti puas always dance in pairs. Boys are recruited about the age of six and continue to perform till they are 14, then become teachers of the dance or join drama parties. Goti puas are now part of professional teams, known as dals, each headed by a guru. The boys are trained for about two years, during which, after having imbibed the basic technique, they learn items of dance, ornamental and expressional. The goti puas, being youngsters in their formative years, can adapt their bodies to the dance in a far more flexible manner as opposed to the maharis. A goti pua presentation is ably supported by a set of three musicians, who play the pakhawaj, the gini or cymbals and the harmonium. The boys do the singing themselves, though at times the group has an additional singer. Odissi: Extract from http://en.wikipedia.org/wiki/Odissi Odissi is one of the eight classical dance forms of India. It originates from the state of Orissa, in eastern India. It is the oldest surviving dance form of India on the basis of archaeological evidences. The classic treatise of Indian dance, Natya Shastra, refers to it as Odra-Magadhi. First century BCE bas-reliefs in the hills of Udaygiri (near Bhubaneshwar) testify to its antiquity. It was suppressed under the British raj but has been reconstructed since India gained independence. It is particularly distinguished from other classical Indian dance forms by the importance it places upon the tribhangi (literally: three parts break), the independent movement of head, chest and pelvis, and upon the basic square stance known as chauka. Origin and history : The first clear picture of Odissi dance found in the Manchapuri cave in Udayagiri which was carved at the time of king Kharavela. Flanked by two queens Kharavel himself was watching a dance recital where a damsel was performing dance in front of the court with the company of female instrumentalists. Thus Odissi can be traced back to its origin as secular dance. Later it got attached with the temple culture of Odisha. Starting with the rituals of Jagannath temple in Puri it was regularly performed in Shaivite, Vaishnavite and Sakta temple in Odisha. An inscription is found where it was also engraved that a Devadasi Karpursri's attachment to Buddhist monastery, where she was performing along with her mother and grand mother. Thus it proves that Odissi first originated as a court dance. Later it performed in all religious places of Jaina as well as Buddhist monasteries. Odissi, was initially performed in the temples as a religious offering by the 'Maharis' who dedicated their lives in the services of God. It has the most closer resemblance with sculptures of the Indian Temples. The history of Odissi dance has been traced to an early sculpture found in the Ranigumpha caves at Udaygiri(Odisha). dating to the 2nd century BC. Thus Odissi appears to be the oldest classical dance rooted in rituals and tradition. In fact, the NãtyaShãstra refers to Odra Magadhi as one of the vrittis and Odra refers to Odisha.